The boat did fine. We were 3/4 full with fuel, 600 gallons of water in the forward tank, aft water empty. Averaged our usual 9.7 knots. The conditions established with my own weather planning were confirmed by Bob McDavitt, whom I used again as a router. Nothing odd in the forecast, with the strongest winds on Day 1 up to 25 knots from the SE, then gradually shifting to the W and moderating as we approached NZ. Except for Day 4, the winds were a steady 30 knots from the E, gusts to 42 knots and the seas were extremely confused, probably the most confused I can remember in a long time. By Day 5 the winds were a steady 30 knots from the W-N/W. Wave size was 8-10 feet with an average “period” of about 4 seconds, and coming from all directions except aft. All in all an uncomfortable trip, but not awful and a pretty typical Tasman Thrashing. My greatest joy on the trip was realizing that I didn’t have to slow down in the crappy weather. Aboard our last boat I would have been slowed to 6 knots and that would have extended the discomfort by at least two more days. This, to me, is one of the great advantages of the FPB. 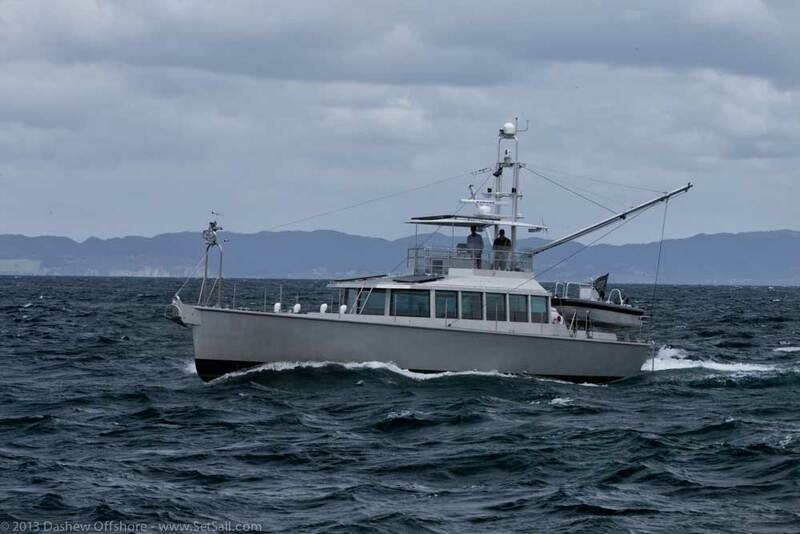 Last week FPB 64-9 Orca made the trip from New Zealand to Fiji with a stop at Minerva reef. 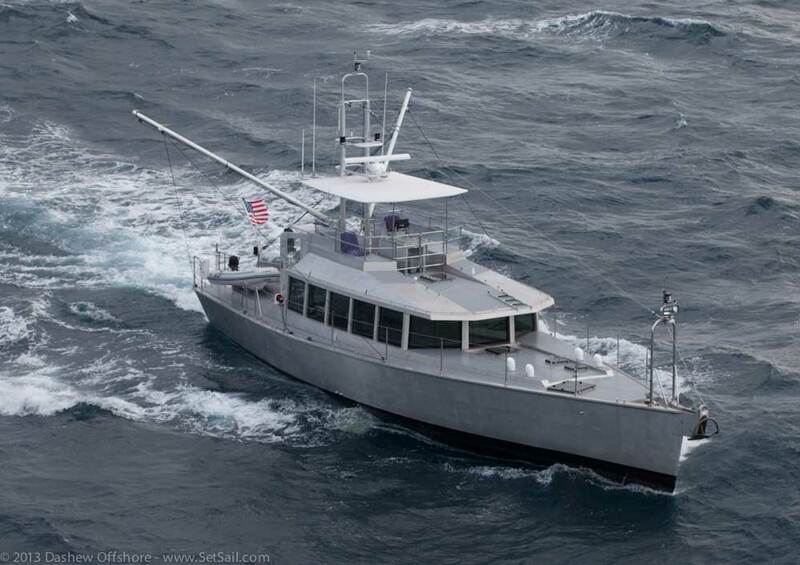 This is Orca‘s first ocean passage. I was scheduled to leave Pittsburgh on May 13 (should have known better). Left for the airport at 0430 and after 6 hours of creeping delays, US Scare canceled the flight. No other flights on the 13th so left on the 14th. After a 20 hour slog, made Honolulu and Iron Lady at 10 PM local. Rick’s forecast looked good for departure on the 15th so we made the call to go. On board for this trip are Capt Steve Parsons and Capt Roger Girvin – both Kiwis, captains and good mates at sea. Roger was with Steve and me for the NZ to Tahiti passage last year. I tried to sleep but finally gave up at 0400 local and went about unpacking 2 large duffels of mostly boat stuff and doing some boat stuff along with some boat chores. Steve and Rog were up at 0700 and after coffee, Steve was off to take the rental car to the barn while Rog and I prepared for departure. 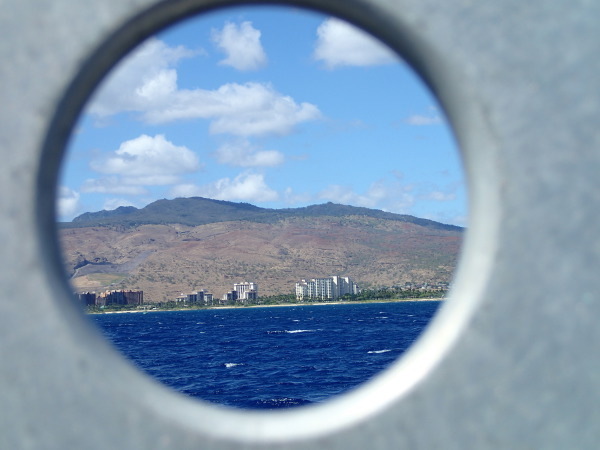 We threw the lines at 0910 and at 0800 today (the 16th) Ko Olina is 182 miles in the rearview mirror. The passage up the lee shore of Oahu was delightful but mother nature reminded us who was boss when we cleared the north end. NE trades were blowing 15 to 20 right on our nose along with 2 meter seas – not bad sounding but the relative period (period noted as the boat moves thru the water) was just 2.5 to 3 seconds – lots of pounding so we pulled the throttle back 100 RPM to keep things sensible. That lasted until the wee hours of May 16 and accounts for our low average speed of just over 8 knots. Winds and seas died overnight and we are now back to our normal cruise of 10 knots with about .5 knots of adverse current. Log entry at 0800 shows a position of 23 57 N and 156 24 W. COG is 029 degrees M, speed is 9.6 kts, seas are NE at 1 meter, winds are light and variable and the barometer is 1021 and rising slowly. Seas slight. Wind direction and strength variable. 1650 RPM – 5.7 GPH, 1700 RPM – 6.5 GPH. Looks like we are fighting about .75 knots current. At 1650 we should be at least 9.7 knots and at 1700, we should be over 10 knots. Right now seeing 9.3 at 1700. Bottom and prop done just before leaving. Alternator loads about 150 amps for some air con and normal underway boat loads. Winds holding steady SSE at 10 knots and barometer is rising – 1023 now. Sounds like high is building and we are motoring into the center of it. Hope it holds true – it is lovely. To hell with 35 knots on the nose – 20 with short period 2 meter seas was bad enough. Lots of crashing – boat couldn’t find her footing. That is why we bore off a bit and slowed down. Holding around 10 knots at present. 0800 position is 27 degrees 0 N, 153 degrees 43 W. Course 028 M, speed 10 plus a bit. Winds SE at 15, seas SE at .5. Barometer 1024 and rising. till appear to be tracking toward/along with the high but some evidence of high clouds to the west. Total distance traveled is 398 NM, 216 NM since 8 AM yesterday, so average is picking up. Fuel burn is 22 liters per hour average at 1700 RPM, engine loading is 60%, alternator output around 100 amps at present. Beautiful day in the neighborhood, unfortunately Shabby (our favorite lure) has come up short on fish. Was scared out of the water yesterday by a 6 foot shark. Strange thing – we have seen 5 free floating buoys over the last 2 hours, all parallel to our course in the same position to port – some orange, some white. Have altered course a bit to starboard to get clear of them. 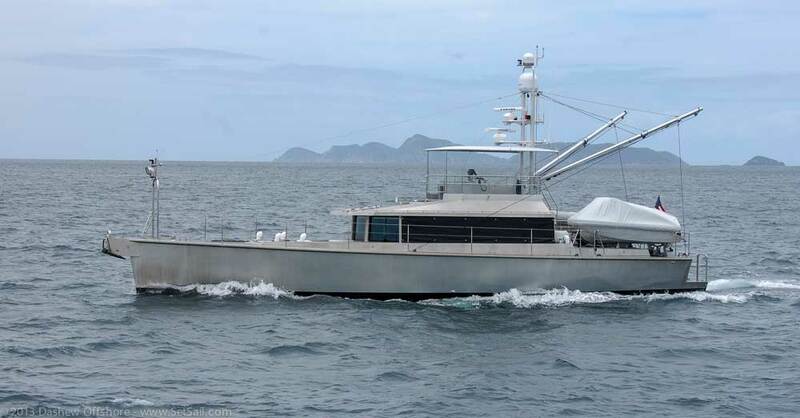 FPB 64-6 Grey Wolf is a day out of Panama, having traveled almost 4000NM since leaving Nuku Hiva 17 days ago and more than 7500NM in the two months since departing New Zealand in late March. Tom asks – How is the experience of the GREY WOLF trip affecting your views on the specification of your new FPB 78? Peter responds – It’s made for a far deeper understanding of Steve Dashew’s design principles. Steve has been great to work with and is very open to ideas that will improve the design, but it’s crystal clear that, fundamentally, his concepts are right for the type of boat this is. Appreciating the difference between ‘things that are nice to have’ and ‘what is essential’ is critical for any owner. All I can add for the new boat are small refinements that fall into the ‘nice to have’ category. Thinking for a moment about weather, how we are receiving forecasts and any routing advice. We are in touch with Weather Bob every couple of days. On this long leg he just advises us of any slight changes as he sees them coming, but he’s always there to answer questions. Having him on hand helping us is of huge value because he can keep a more precise view of a far larger area than we ever could. Being ashore, he is in a position to use a solid internet connection to acquire all manner of data. We don’t have anything like that level of downloading power. All that having been said, weather models for the Pacific at the present time are not as good as their Atlantic equivalents, so it’s reassuring that we have some sound, basic weather knowledge on board. Between us, we can still make sense of things when what is predicted isn’t what really happens. What do I like best about GREY WOLF? What I really love is the boat’s comfort in the sort of seas into which I would not normally consider taking a motor boat. She glides happily through a force 6 as if it were a force 2, and her broad spectrum of backup systems gives the crew total confidence that if any problem develops out at sea there is always an alternative waiting for deployment. The original issue can then be set on one side, to deal with at one’s ease in the next safe harbour. The boat does exactly what Steve Dashew says it does: Long Range Motor Cruising in comfort. Arrived Neah Bay. 31 hours nonstop from Coos Bay, southerly the whole way – nice ride, fast trip. Overnighting tonight at anchor, fishing tournament so no marina space plus a waiting line at fuel dock so no cheap fuel! Tomorrow going to Port Townsend and spending 2 nites there. Leaving Pt. Townsend early Monday morning arriving at the locks about 11 a.m. Watching AIS looks like Sarah Sarah is in Pt. Townsend as well! Carol has a post up on the first part of their trip with her usual stunning photos. Completing what will be a trio of FPB 64s in the Northwest this season, FPB 64-2 Sarah Sarah is currently at Shilshole Marina in Seattle. This entry was posted on Saturday, May 17th, 2014 at 6:07 pm and is filed under Dashew Logs, four, FPB 64 Passages, The Logs. Both comments and pings are currently closed.